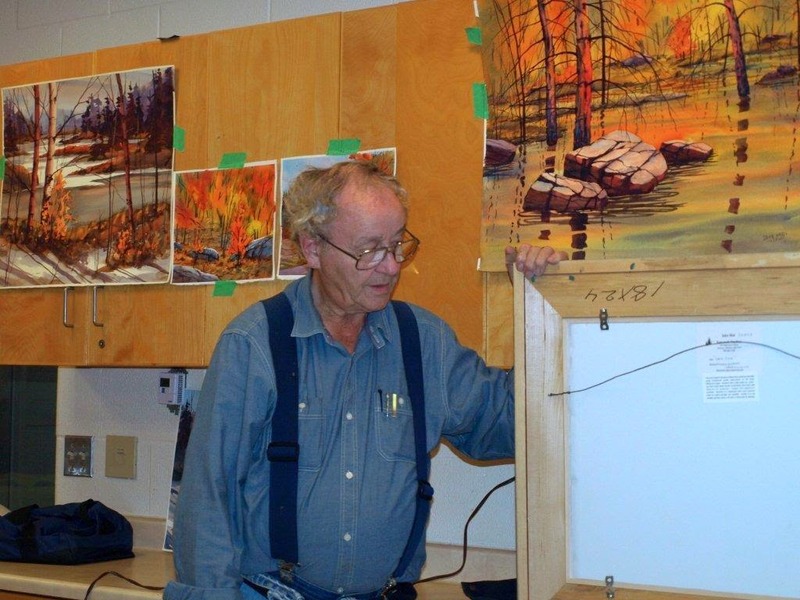 Jake Mol came to the BWS meeting on October 14, 2014, and while he was scheduled to paint a water scene, he decided to do a fall scene instead. He started out by talking about one of his paintings that he brought with him. He basically said that he re-uses his frames so he uses the type that allows him to transfer the paintings whenever he desires. He does not put glass on his watercolour paintings. Instead he uses Golden MSA medium which has UVLS protection. This medium is a polymer product which contains no water and he says it is tougher and more resilient than others. The watercolour pigments stay completely transparent and they are not adversely affected in any way by the use of the medium. 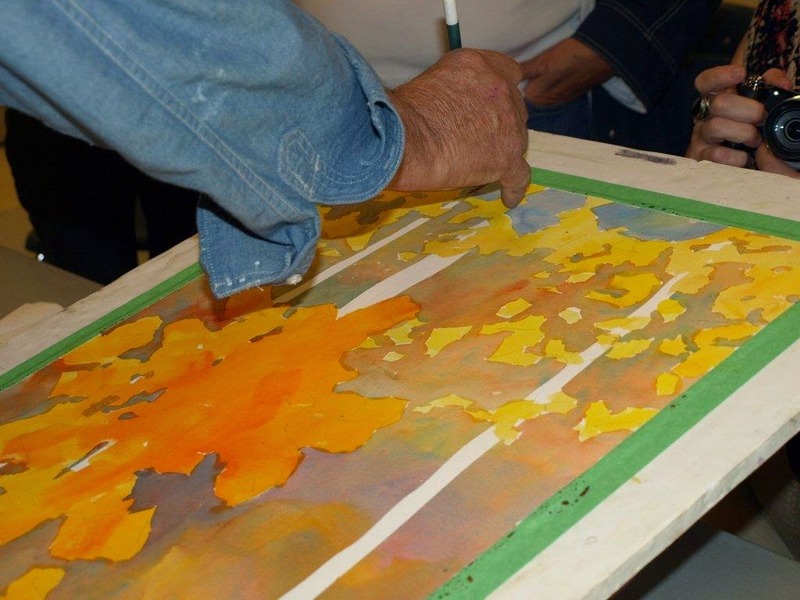 After Jake puts on the medium and the painting is properly cured, he then mounts it on a Duro Plast board which is lightweight and rigid and gives better protection to the painting. It is then put in the frame. 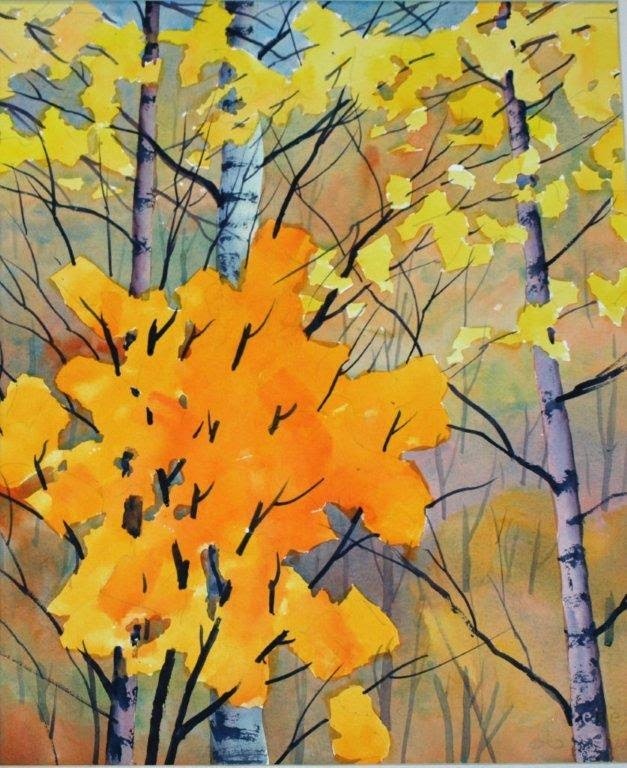 He generally uses Arches watercolour paper (approximately 200 lbs.) and Winsor and Newton paints (he usually buys #1 paints). He tends to stick with one manufacturer because he knows for sure how these paints react. He always uses two colours to paint an area because in this way one gets a sparkle in the painting. 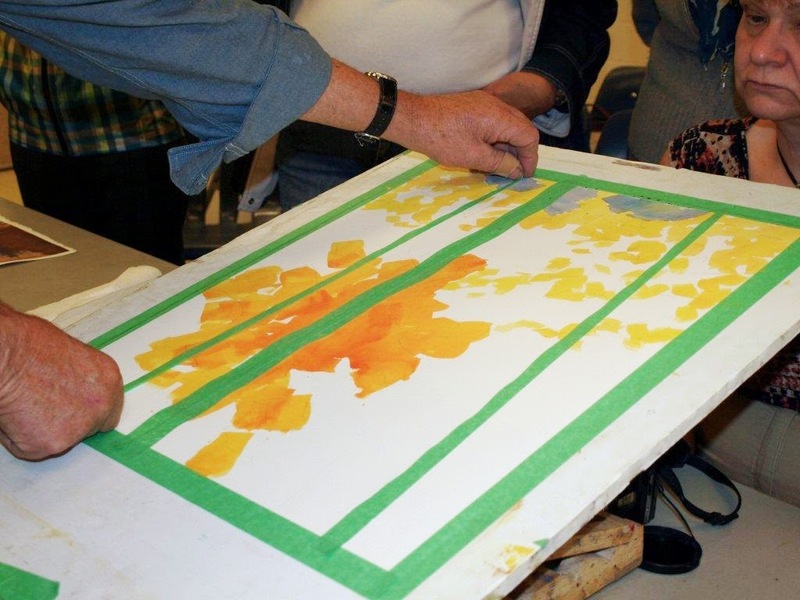 At the top of the background in the demo, he used Cerulean and Alizarin Crimson and for the the orange leaves, he used Indian Yellow and Permanent Rose. Regarding technique—he uses his board at an angle so that the water keeps travelling down and in this way, you do not get a blossom. As you can see from the photos, he uses the green tape to mask out his birch trees. The demo painting is incomplete—he intends to finish it some time later. Regarding the other painting that he brought, he reminded us that water is a reflection of the sky and that is how one decides the colour to use when painting water. He also mentioned that when you are painting rocks in the water, you must indicate that the rocks are sitting in the water. 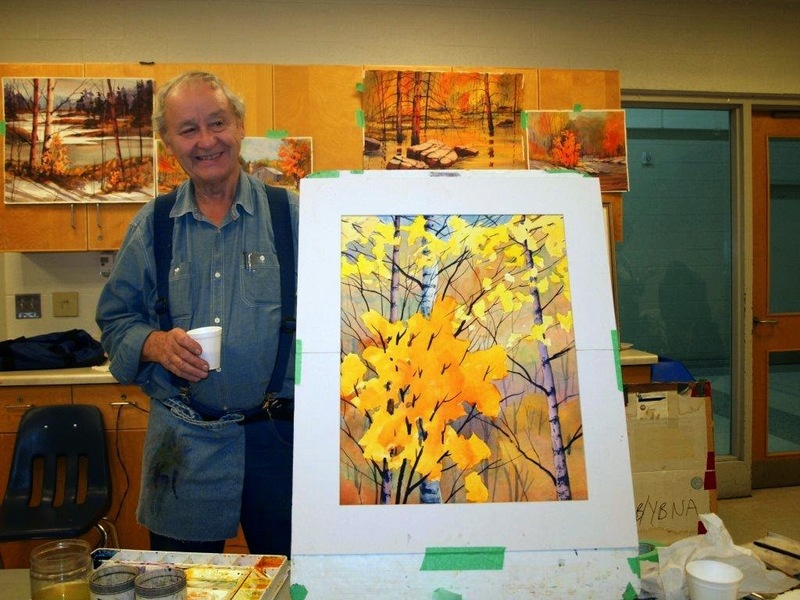 He uses yellow ochre to make drawings of the rocks--this usually disappears when you put on the proper colour for the rocks.